Teaching: The Unthinking Profession | Eat.Sleep.Teach. I have been on the road again this week delivering training in a number of schools. I really enjoy the experience and always learn from the people I work with and it is tremendous fun. However, as a trainer I know that sessions packed full of practical strategies will go down really well and this is beginning to trouble me. I worry that theory and context are almost vilified in the profession and we can no longer see past the quick fix of a good practical tip. Before going on I would like to say that I exclude the users of twitter from this description – they are keeping the art of theory alive (take a look at #edjournal for proof). They are, however, a minority and only in the most enlightened schools are they central to decision making. 1. Teachers, in general, are not interested in theory. The sessions where there is a substantial theory base will always get a weaker reception. Teachers want ‘stuff’ they can take away and use tomorrow. While I always show how the theory works in practice, it never seems to have the same impact as CPD with titles like ’10 engaging starters’ or ‘7 great discussion tools’. While there is a place for practical tips, but I know that this approach offers little impact. A good idea might be used once or twice, but understanding how it works and why it works will bring lasting and sustainable alterations to teaching methods. The ‘quick fix’ is just that and somewhere down the line a proper solution needs to be found. I see too many Senior Leaders promoting ‘Sharing Good Practice’ sessions as the way to improve teaching and learning in their schools. While it will allow for a dialogue to be a created about learning it needs to be followed up with a ‘Sharing Good Theory’ session where staff explain the philosophy behind the techniques that they use and why it leads to better learning. 2. If we can’t see the relevance of theory then how do we move forward? If only a small minority are reading about new approaches and trying them out, experimenting and refining, how can the profession raise itself up to better standards? Few people have heard of or seen Sir Ken Robinson, hardly anyone has read Geoff Petty or John Hattie, let alone slightly leftfield texts like those by Steven Johnson or Daniel Pink. I am concerned that standards will not improve in the majority of schools, because no one is looking into what is possible and exciting. 3. 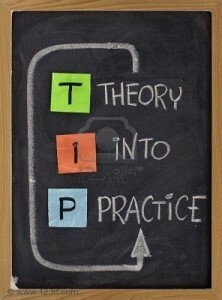 I think the attitude of the profession at large towards CPD and theory plays into the hands of our critics. Some politicians and large chunks of the population see teachers as lazy and stuck in their ways. They view teaching as being a simple set of skills, that as Michael Gove put it can be passed on from the master ‘to the apprentice’. I firmly believe that teaching is a highly creative discipline, providing tremendous scope and freedom to experiment. But it also consists of patterns and lines that can be follewed to create a more firm understanding of the students in front of you. Without theory to map a route we are either aimless or rigid, and neither is good enough in education. I find it hard to imagine a doctor being negative about new approaches in their specialism, or lawyers refusing to read the lasted case law. Why should teachers resent good CPD and theory? I have talked to many teachers about this and most feel under pressure to perform well with exam groups and to meet expectations. They get observed occasionally, pull out a few tricks and set pieces, and then get back on the treadmill of reports, emails, marking and planning. They feel like they do not have the time to read theory and experiment, it intrudes on their daily business of survival. Also, the quality is not always there in CPD sessions and people get turned off. It is hard not to feel sympathy for this argument, but we need to break it down and move the agenda on. Leaders need to take bold decisions and teachers need to talk about theory, share it, just like we do on twitter, and help to breathe new life into our unthinking profession. Great post, and certainly one that chimes with my experience. I’d add one more factor that stops this coming up, and that is the huge divergence in opinion that exists about both the purpose of education and the best way to achieve that. I’ve always got the impression that many leaders are aware of the issues, but would rather not open up the can of worms for fear of the potential for division. A tiny, cynical piece also wonders if some school leaders are happier with staff not having this knowledge and therefore being in a position to argue against ‘their vision’ of that particular school. Thanks for the comment Dave. I agree with your point – too many leaders see the agenda as being about points and league tables. Decisions are taken and policies implemented with only this in mind. There are, of course, exceptions: one school in Suffolk has embedded a action research culture that generates 10 publications a year – all freely available to staff (you can see samples here). These institutions are though to few and far between. While divergence of opinion might be an issue, surely it has to be better than no opinions at all. I would like to think that leaders aren’t as cynical as your last point insinuates, I think more often than not it does not occur to staff to find relevant theories or occur to leaders that it might be important. Teaching, in many schools, has become full of systems and processes all of which need immediate attention. To quote Steven Johnson, where is the room for the ‘slow hunch’ to develop? Great post and the issues you highlight occur everywhere. One issue I would like to address (and there are plenty others) is the link to ‘thinking’ institutions. It is almost impossible for me to access the latest thinking on the subject I teach unless I sign up to a course or am lucky enough to hear about a public lecture. A stronger link to university departments/resources would be one way to help keep the ‘thinking’ element alive for school staff. I happen to agree on all 3 points as they resonate with my 15 years of teaching. The percentage of teachers who actually read and try to understand the theoretical framework (and question it when necessary!) is very small. We demand or expect our students to be lifelong learners, develop critical thinking skills, and read extensively but we as teachers (and I refer to the majority of us) fail to model that ourselves. What I’d like to see is a whole lot more rigour and organization rather than good practice in a narrow context. You’re in a position to deliver that to ITT students and current staff alike, so do us proud! Thanks for sharing these interesting thoughts. I also never cease to be surprised by the lack of interest for theory displayed by most of the profession. I think it is so important to step back and consider the wider reasons and purpose for what we do- yet as you say the day to day tensions seem to over ride that so often. I think the proposed move away from Universities as the main providers of ITT is very dangerous, as it risks further marginalising the importance of theory in the minds of many trainees. Enough of them are not interested anyway, we need to be challenging them to give it more importance, not implicitly reinforcing theses thoughts. I think your idea of a culture of sharing practice backed up by theory is a very interesting one. People often do not see the relevance of theory, and I think making those links explicit could be key to putting it back on the agenda for many more practically focused teachers. Lots here in favour of ‘increased professionalism’ in teaching & networks of learning communities. There’s a fair bit of writing on this. Ditto previous sentiments. To teach you need a first degree (many have post grad qualifications) and a specific accademic ITT qualification – very similar to other professions (Doctors, Vets etc) — so as a profession we are accademic and big thinkers. Yet the moment we end up in the classroom, the vast majority of teachers become “coaches”, more interested in immediate success than the longer term rigour of their chosen profession. I loved learning all about pedagogy, Piaget and Vygotsky’s zone of proximal development — concepts that I come back to time and time again. That being the case, the majority of teachers spend CPD time bemoaning how bad it is — yet don’t offer to share something themselves. One yard stick I use, is the number of teachers in an establishment that are members of professional organisations (such as the IOP, ASE or other subject specific ones). We have 85 teachers, yet only 5 are active (myself included) members of professional bodies. We (teachers) need to remember from time to time that we are a profession, not a trade. Thanks Nick. I absolutely agree with you about professional knowledge – I would love to be able to spend time learning from the latest research in History. I try to read as much as possible (I tend to alternate between novels, Historical works and something unusual), but the quality varies. We do need more access and opportunity, but I fear that at the moment events like of the nature that you suggest would not be well supported. My hope would be that better access would spark interest. It might be something that we could pioneer for the East. Fancy trying to sort something with me? Thanks Cristina. Your point about modelling the learning behaviours we expect from students is really interesting. It would be fascinating to look at what expectations teachers have and see if there is a coloration with their stance on theory and CPD in general. I would suggest that many who don’t value theory would have more of a ‘spoon feeding’ approach to learning, or use active learning without proper reflection time built into lessons. Thanks Doug and Oliver. I share your concerns about teacher training, both the shortened time and also the idea that it should be more ‘practical’ than at current. I think this will lead to a less rigourous training and encourage poor professional standards. Part of the issue, I think, is that teachers lose the ability to reflect on their practice. Partly this is down to time pressures and demanding days, but it is also down to their perception of the job. If teachers respected the job as a profession and engaged in it at that level then we might start to get somewhere. This is one of the reasons I have restructured CPD in school. For the next 18 months all our INSET days will be run by our own staff and it has to be based on action research. We had an open forum and decided on five priorities and these have become the focus of small groups. I am hoping this might turn the tide. Doug, I would like to be involved in the purpos/ed debate; I have commented on a couple of the excellent posts, but if their is more I can do then let me know. Thanks for the comment Miles. Found this research report from T. Hyland Bolton University and thought it was really interesting – compares ‘professional’ teachers to jazz soloists. A great read. Will research further though, it is fascinating. I agree Glen. It was comments like the ones you quote that nudged me to write the post in the first place. I don’t like to generalise, but it is a problem that I think is growing and unless people start checking the slide we could be, as a profession, in serious trouble. Your point about professional bodies is an interesting one, we need that level of debate and analysis. The issue now is how we get more staff to partake.